The season has begun to start thinking about what to get for a special lady. Or, perhaps you are that special lady and you’d like to treat yourself– so, why not indulge? Dardiman's couldn’t agree more. That’s why we’ve pulled together a list of the healthiest, most elegant, and most importantly edible gifts for women that you can find on the market. Whether its for the holiday party at work, or a beautiful basket for your loved one, these are the 7 best gifts for women to get this year, and they’re all made fresh in the USA. There is no other way to bring the tropical festivity off the shores of Hawaii into the mainland’s Winter and Fall seasons without our paper thin Hawaiian pineapple crisps. Rated as our most in demand fruit crisps, these succulent delights are fitted into a premium hard pressed paper box with a magnetic flap. But that’s the part of this gift that’s function. The crispy contents are definately the treat, but you won’t feel anything except pride handing this gift with a cut out stencil of a life-sized pineapple cut right into the box itself – making for an gift that needs no introduction. If there was a scoreboard for the amount of times that blood orange sold off the shelfs from our partners, the White Chocolate Blood Orange would be closest to the finish line – and we know why. 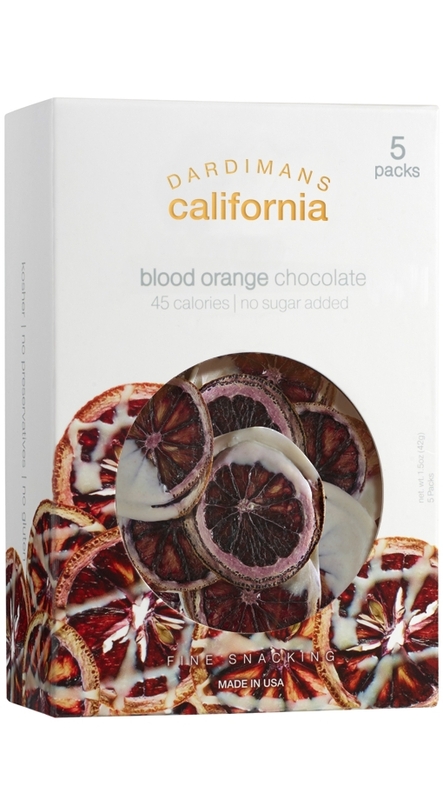 These delicate chocolate dipped blood orange crisps are gems in the orchards of California. Their season is short, and the harvest – delicate. That’s why we packed this gift box with 5-individual packs – to allow for whoever you give this gift to (or enjoy yourself) to pace the scrumptiousness awaiting within, in intervals of five. 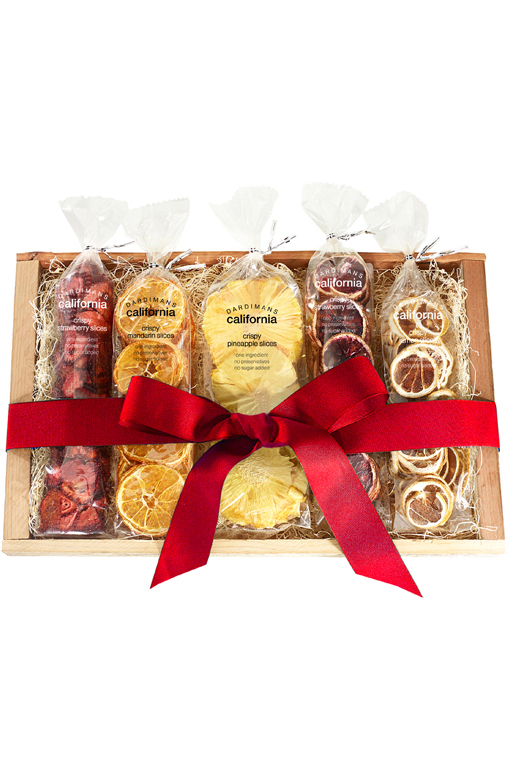 Our blood oranges are straight from the heart of the California citrus valleys, and this box is best selling for the Fall/Winter season. Some gifts are best suited for pairing. For us, the best gift for women in this instance is to take one of the many varieties of our premium gift boxes and pair it with a bottle of wine, a favorite cheese, a deluxe can of the finest caviar! Some customers have even had the creativity to pair the premium gift boxes with another crispy match. Blood Orange with Tomato for both aperitif and dessert, or a citrus range of mandarin, lemon and orange. It’s best left to the taste buds of the gifter to the giftee – and no better way than to choose than to listen to which fruit crisp’s premium gift box gives your stomach more growl. A solid box with its own elegant design. This is one of Dardimans' more classical approach to an assorted gift box. Both clean and sharp around the edges with a royal white to wrap this assortment in a preponderance of class. No need to wrap this gift for your loved one, as the cover comes in an option of solid white, or with a clear window to tease of the delectable goodies inside. 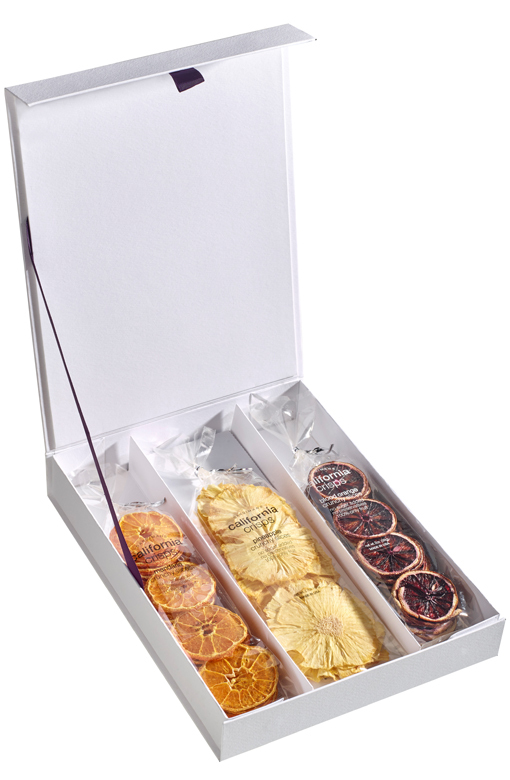 The 3 piece assorted crisps gift box is usually filled with the season’s highlighted fruit . 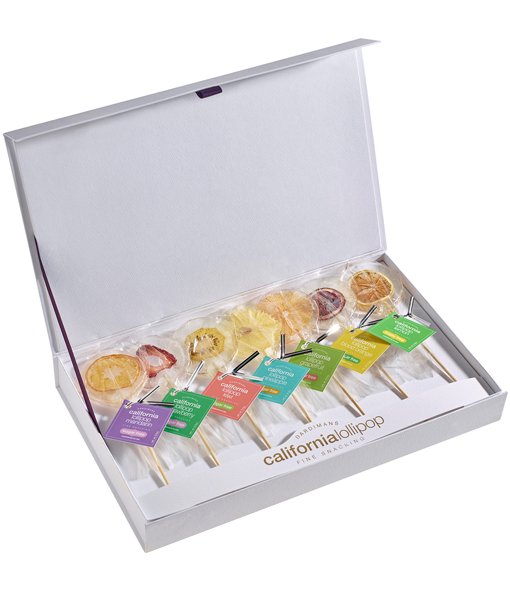 The popularity of our Dardiman lollipops cannot be stated enough. Moms love them because of their organic isomalt (sugar beet) sugar-free substitute. Husbands love them as a beautiful ornament to wrap on conventional gifts, and families love them because it’s the healthiest lollipop on the market. Having the choice of 7 is why this assortment makes it on our list of solid gifts to give to women. Not to mention that the box itself is in or premium pressed-paper magnetic flap box – making for an easily wrapped and presentable gift! If #2 didn’t salivate your jawline, the triple threat of these crispy and sweet treats surely will! The Chocolate Citrus Crisp is the newest item on the roster from Dardimans. 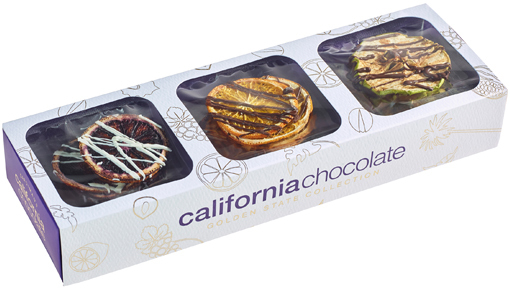 Made with the freshest fruits we found on this year’s orchards – most of the boxes are packed with our blood orange dipped in white chocolate, our orange crisps dipped in our dark chocolate, and what we’ve dubbed the Christmas apple – a tasty and hearty companion of sweet green apple drizzled with premium darkchocolate. This box is a holiday favorite, and best suited to follow a romantic evening. No matter which of these premium boxes that you choose, any of them can serve as the best gift for women. All include a flavor of class, potent flavor and an aesthetic that most won’t find in a retail store – these gift boxes and options are prepared by Dardimans, for Dardimans customers to the highest quality that we can offer. The fruits may be made in California, the boxes, the labor, the packaging all done in house by Dardimans – but the one thing that is the most important, is that our customers receive only the highest quality of service and product no matter what time during the year they shop with us. Enjoy! I could not find the Chocolate Citrus Crisps on your site or I would have ordered them. How can you get them?